Since 2009, when the WIPO Indigenous Fellowship Program was launched, members of indigenous and local communities have worked in WIPO’s Traditional Knowledge Division on issues relevant to indigenous peoples. The WIPO Indigenous Fellowship builds on a series of initiatives to ensure that indigenous peoples are actively and effectively involved in the work of WIPO on issues that matter to them. It recognizes, and seeks to foster, the strong legal expertise that exists within indigenous peoples, and offers a professional opportunity to an indigenous person to work within the WIPO Secretariat. The Indigenous Fellow will work in WIPO’s Traditional Knowledge Division and be involved in a program of work that is directly relevant to issues of concern to indigenous peoples, including the IGC process, WIPO’s outreach to indigenous peoples and local communities, WIPO’s capacity building activities, and WIPO’s cooperation with the United Nations Permanent Forum on Indigenous Issues, the Expert Mechanism on the Rights of Indigenous Peoples and the Special Rapporteur on the Rights of Indigenous Peoples. These include the WIPO Intergovernmental Committee on Intellectual Property and Genetic Resources, Traditional Knowledge and Folklore (IGC), outreach to indigenous peoples and local communities, WIPO’s cooperation with the United Nations Permanent Forum on Indigenous Issues, the Expert Mechanism on the Rights of Indigenous Peoples, and the Special Rapporteur on the Rights of Indigenous Peoples. The fellowship responds to the reciprocal needs for stronger capacity in the rapidly growing domain of indigenous IP law and for strengthened capacity on IP law and policy for indigenous lawyers and policy advisers. French, Russian or Spanish) would be an advantage. Having a record of relevant publications (general awareness-raising, formal legal analysis or scholarly publications) would be an asset. 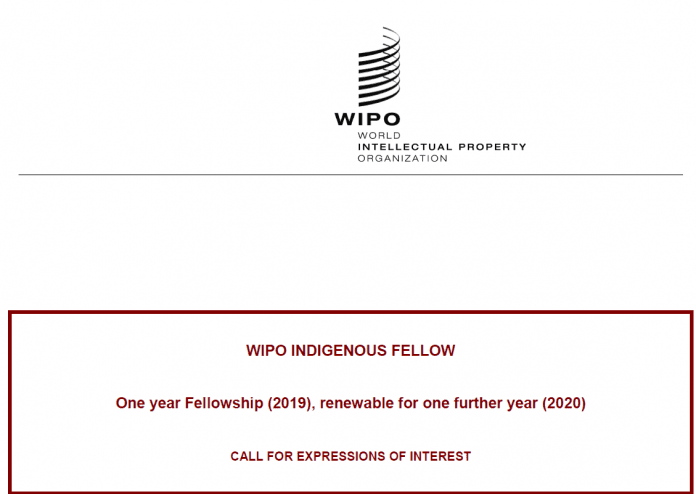 The Indigenous Fellow will be selected on the basis of a demonstrated capacity to contribute directly to the approved program outputs established in the WIPO Program and Budget. The Fellow will need to be available to commence the Fellowship in Geneva in the course of December 2018 or January 2019. Term of fellowship: One year, renewable for one further year only. Travel expenses and a monthly stipend are payable; details are available on request.